Michigan Tech faculty and staff may access their 2019 Open Enrollment through MyMichiganTech or Banweb. We want to remind you that Duo Two-Step is used for this access. Below are some tips for using Duo. We also have more information about Duo in our Knowledge Base. Trying to authenticate with your mobile device without cell service? No problem. 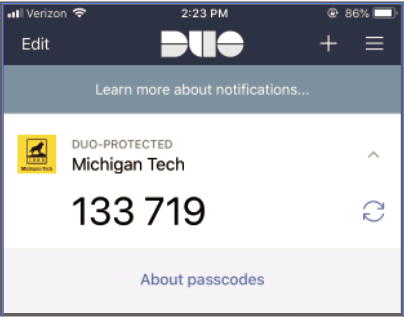 Duo’s Mobile app acts as a token generator and can generate a one-time security code even if you have no cell service or WiFi. Just click the arrow icon on the right to generate a one-time security code. 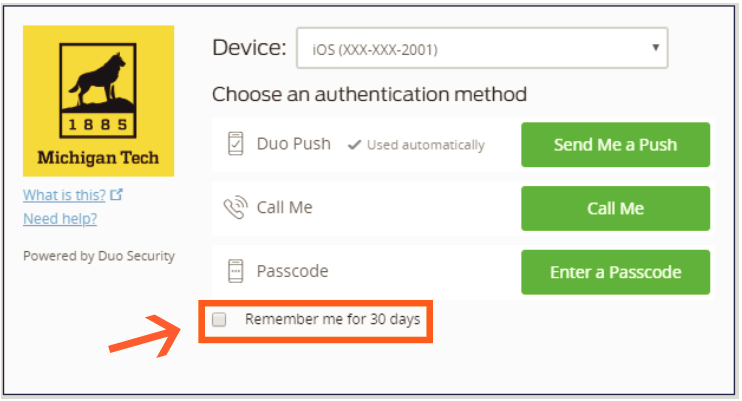 For your convenience, you can select Remember me for 30 days when logging in on your personal device and Duo will remember and not ask to authenticate for 30 days on that device. More questions on Duo? We can help. Contact us at it-help@mtu.edu or 7-1111.